Love says, "I am everything"
Wisdom says, "I am nothing"
Julia “Mandala” Weaver, LMFT is the founder of Art and Soul, a resource center for spiritual practice, embodied spiritual psychotherapy, and expressive art. Her 30 years of ongoing practice and study include the Buddhist, Advaita Vedantic, Navajo, Shamanic Sound Healing with Tito La Rosa and Sufi traditions, along with Zhineng Qigong, (translated and transmitted as "Wisdom Healing Qigong" by Master Mingtong Gu), Continuum Movement, 5 Rhythms, Soul Motion, iRest, and Sensory Awareness body practices. She has been an ongoing student with Zhineng Qigong, (translated and transmitted as "Wisdom Healing Qigong" by Master Mingtong Gu) since 2010. Julia has been an active graduate of Nine Gates Mystery School since 2009. She has an MA in Integral Psychology (1987), a BA in Fine Arts from UCLA, a certification in massage, along with extensive training in sound/movement expression. Julia is also a licensed psychotherapist in private practice since 1992. (MFT License #30156). She works with individuals, groups and sangha circles in person and via phone and Skype or Zoom. All that she offers is dedicated to supporting an embodied spiritual awakening that is in service to Gaia and all sentient beings. Her intention is to perceive and reveal the Light inherent in all Life while resting in the “Heart of Luminous Darkness,” letting all response emerge from the fertile womb of silence. While swimming off the Kona coast in 1996, Julia had a mystical experience where she experienced a shamanic initiation by shark medicine "mano". 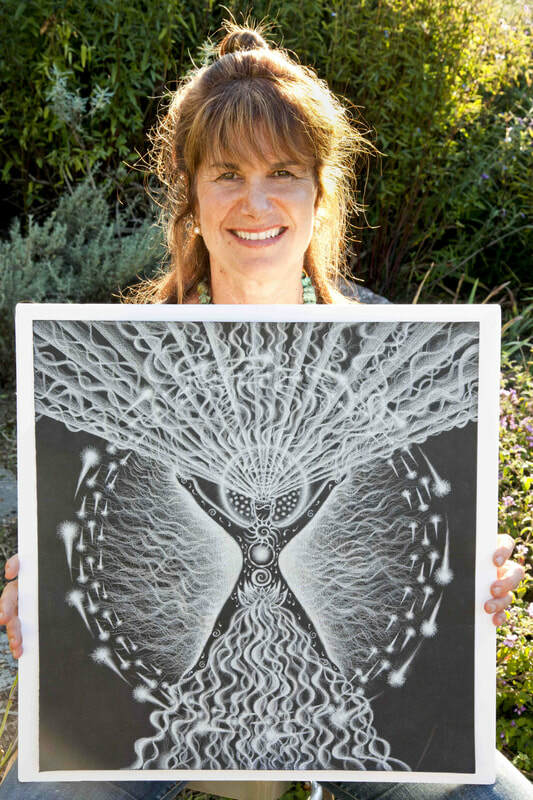 She spontaneously received mandala images, which took her into deeper dimensions of healing and spiritual practice. She has written about this experience in "A Dolphin's Smile". Two weeks after her initial experience with the shark medicine and subsequent swims with wild dolphins, she began studying with Dr. Judith Cornell, author of Mandala: Luminous Symbols for Healing. She gratefully apprenticed and assisted her mentors in workshops through 2001. Since 1996, Julia has offered mandala workshops and presentations for adults and children across the US, Hawaii and London, at locations such as Spirit Rock Meditation Center, California Institute of Integral Studies, Nine Gates Mystery School, Women Of Wisdom the International Imagery Conference, and Partners for Youth Empowerment. She also offers webinar workshops that are accessible globally and finds great joy in guiding groups on dolphin swim retreats in Hawaii. She has continued to experience deep physical healing and spiritual awakening through her contact with these highly evolved beings. Many of her mandalas have been birthed in her annual pilgrimages to Hawaii. She is an Environmental Arts Educator, facilitating rite-of-passage ceremonies that combine sacred intention and the Mandala Process with gardens, rituals, collages, and tree planting. These ceremonies promote community re-vitalization, ecological healing and world peace. She also uses the mandala process as a creative consultant with non-profit organizations and is available for consultations or embodied psychotherapy sessions in person and by phone. In response to the events of September 11th, 2001, she creates large-scale community interactive Peace Mandalas called “One World One Heart”. It is her deepest joy to invite others to experience their own embodied luminous divinity through private counseling, retreats, webinars and the sharing of her visionary art, all in service of personal, environmental and social healing. She loves to collaborate! Her adult workshops were featured in New Age Journals (Body and Soul) (Spring 2001), and she co-facilitated a workshop for children with Julia Butterfly Hill and Jane Goodall at the Kinship with All Life conference held in San Francisco. Her chapter on "Goddesses of the Ocean, Healers of the Sea" is featured in the forthcoming book Artists Envisioning the Divine. Her work was featured in the New Age Journal (The Picture of Health), Mandalas Journey to the Center, Feminine Mystical Art , Dr. Judith Cornell's The Mandala Healing Kit (2007), and other publications.